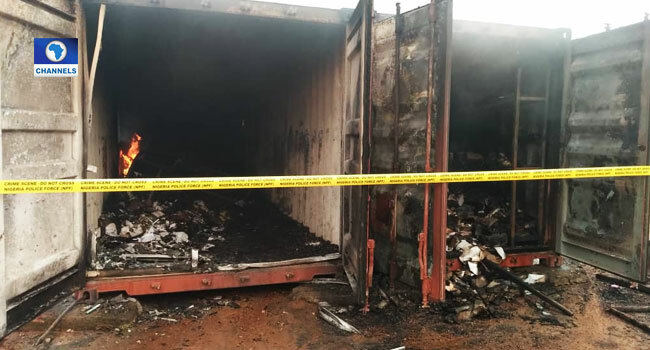 Two containers said to be packed with sensitive electoral materials meant for Saturday’s presidential and National Assembly elections have been gutted by fire at the office of the Independent National Electoral Commission (INEC) in Awka, Anambra State. The Resident Electoral Commissioner in the state, Mr Nkwachkwu Orji, confirmed this to Channels Television on Tuesday. He said although the burnt containers were the Commission’s major storage facilities in Awka, it was too early to say how much damage was done to the materials or to what extent it would affect the forthcoming elections. While the exact cause of the fire is yet to be ascertained, Mr Orji ruled out the possibility of arson, saying that a spark could have triggered the fire. The incident is said to have caused confusion among INEC officials, as firefighters and security officials battled to put out the blaze. This comes on the heels of a similar fire disaster which occurred at the INEC office in Isialangwa South Local Government area of Abia State on February 3, where Permanent Voter Cards stacked in the office were set ablaze last week. The following Sunday (February 10), fire also destroyed permanent voter cards and other electoral materials at the INEC office in Qua’an Pan Local Government of Plateau State. The incidents prompted the Acting Inspector General of Police, Mohammed Adamu, to direct that security be beefed up around all offices and facilities of INEC across the country.